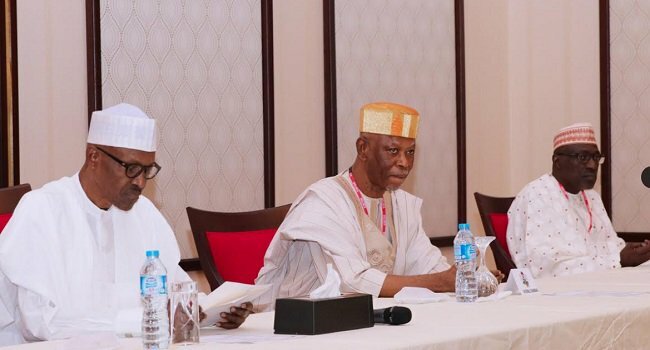 President Muhammadu Buhari on Friday held a closed door meeting with select leaders of the ruling APC and PDP. During the meeting, he thanked those in attendance for finding time from their schedules to come all the way to Abuja to see him. “This visit signifies the unity of Nigeria. It is not a party occasion. It is not a political gathering. It is a symbol of our National unity. It is also an expression of the maturity of our democracy,” Buhari said. “Multi-party democracy is a very tried and tested form of government. Opposition does not mean hostility, enmity or antagonism. Democracy needs opposition, one which is vibrant but responsible. “I am very pleased to see you assembled here all shades of opinion in Nigeria. Please convey to our countrymen and women in your respective states my deep gratitude to all those who prayed for my recovery.